Helping SMEs to Become More Bilingual | Delwedd Ltd.
You may have read in the news lately that the Welsh Government are committing £400,000 to help small and medium enterprises (SMEs) to become more bilingual. 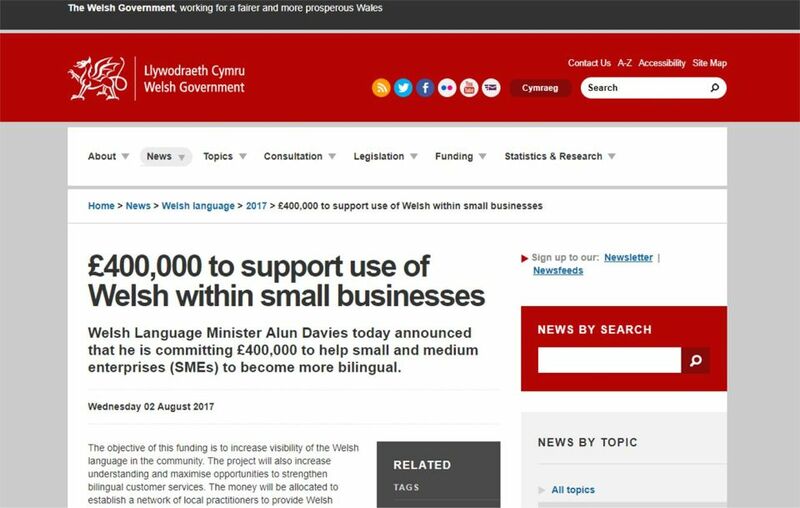 We at Delwedd welcome this news, and believe this will be a great support to many SMEs who already use Welsh in their business, as well as those who would like to begin doing so. Following this announcement, we would like to draw your attention to an offer we run, which you may not be aware of. For many years now, Delwedd have offered to build and setup the Welsh version of your website at no extra cost. For more information on this, please click here. Many other web design companies charge extra for building a bilingual website, however we at Delwedd feel it is important that this cost isn’t a disincentive for building a bilingual website. We particularly feel it is important to get Welsh online, and so are happy to remove this hurdle for our customers. If you would like more information about this, please feel free to contact us.